Used widely during the Second Sino-Japanese War. The last biplane designed by Nakajima. The A4N is a standard representative of the Japanese branch with good maneuverability. It's Maneuverability is slightly worse than the Soviet representative, but the difference is negligible. Decent speed, however it is only above the American counterpart, the F2F. Its Weapons are relatively mediocre. The advantage is that all the weapons are one caliber, and it's more comfortable shooting.The combat Strength is low, but it is traditional for Japanese aircraft. As a result, we get a good enough plane for cornering fights, this style of play will continue in this line and more. Get involved in a landfill, with distracted opponents. Sit on their tails, and stick away from those with rear gunners. Avoid frontal attacks in all cases. In general, the Japanese aircraft line requires careful maneuvers. You can mount outboard bombs for use on ground targets. Note that this slows down your mobilty a bunch until you offload them, so dump them quickly and get back to the fighting. The Nakajima A4N was a carrier-based fighter used by the Imperial Japanese Navy, and the last biplane designed by Nakajima. The first prototype was completed in 1934, but due to engine trouble the aircraft did not see service until 1936. 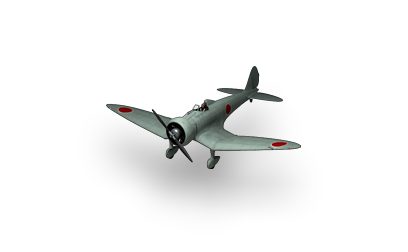 Given the Nakajima internal designation Nakajima YM, the Japanese Navy designation was Type 95 Carrier-based Fighter. A total of 221 were built.